To evaluate a proposed withdrawal, first locate where the withdrawal will be placed on the map. Next click the "New Withdrawal" button below. Then click on the map where the withdrawal will be located. Enter latitude/longitude coordinates below to find the specificied location on the map. Enter the address at or near the withdrawal location. Please spell street names correctly in order to ensure system accuracy. The WWAT was originally launched in 2009, and housed at the Institute of Water Research at Michigan State University. The second and current version of the WWAT is housed at the State of Michigan's Department of Technology, Management & Budget (DTMB). * Fields indicated with an asterisk are required. Note: Well Casing Depth is the shallowest depth that the well will draw in water - not the total well depth. 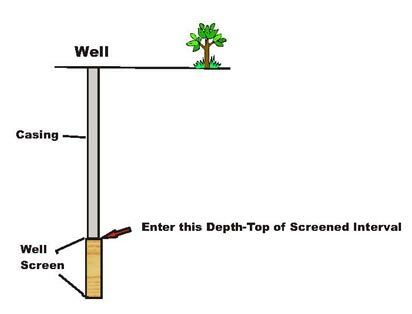 For wells that have a screen installed, the depth to the top of the well screen must be entered. Click to view an example. For wells without a screen installed, enter the depth to the bottom of the well casing. For Shallow Ponds, enter the pond depth. Enter the value in feet below ground surface. The point on the map is the location of the previous withdrawal. To change this location either enter new GPS coordinates below and click the "Use New GPS" button OR click the "Use Map" button to select a new location for the withdrawal using the map. If you are not changing the location of the previous withdrawal and only need to change other characteristics like well casing depth, capacity, etc. click the "Change Characteristics" button.